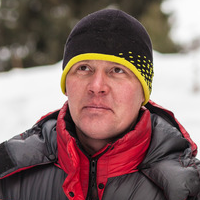 Rank ANY Website, Video, Profile to #1 With The "Guru" SEO Tactic AKA 301 Redirects. Dominate Search Engines With Powerful 301 Links! 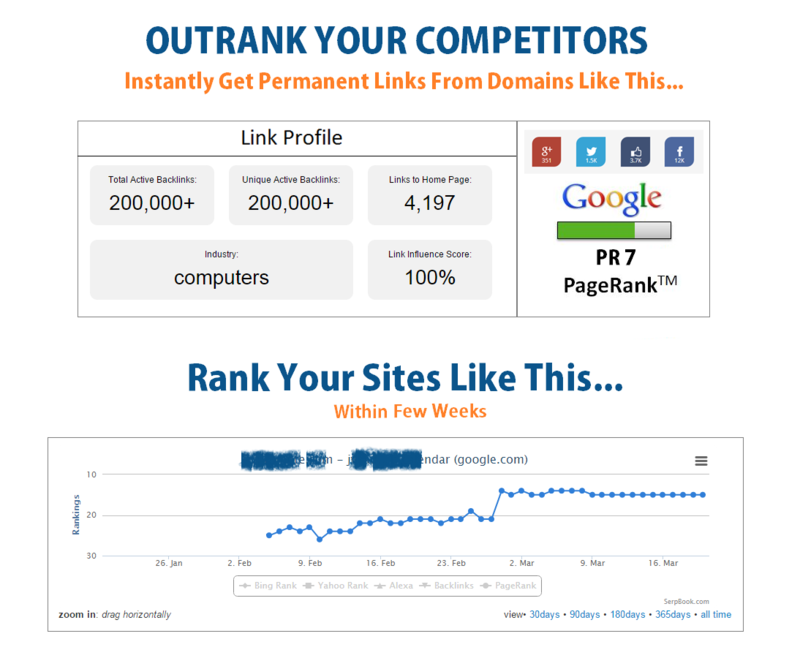 Build backlinks on hundreds of high authority websites and rank higher in all search engines. 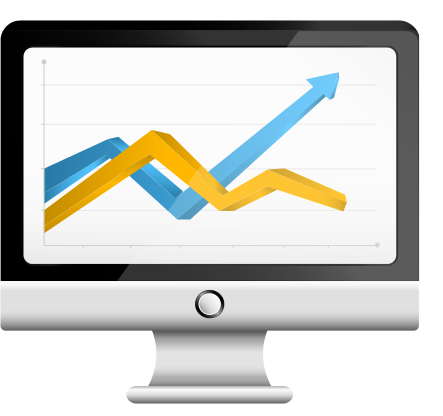 Get organic search traffic and convert more leads. With 301Ranker, you can not only rank personal sites but create campaigns and save white-label reports for your client sites too. Stop wasting your time and money on link building services that are good for nothing and usually end up getting your web pages banned by the 'G' updates. 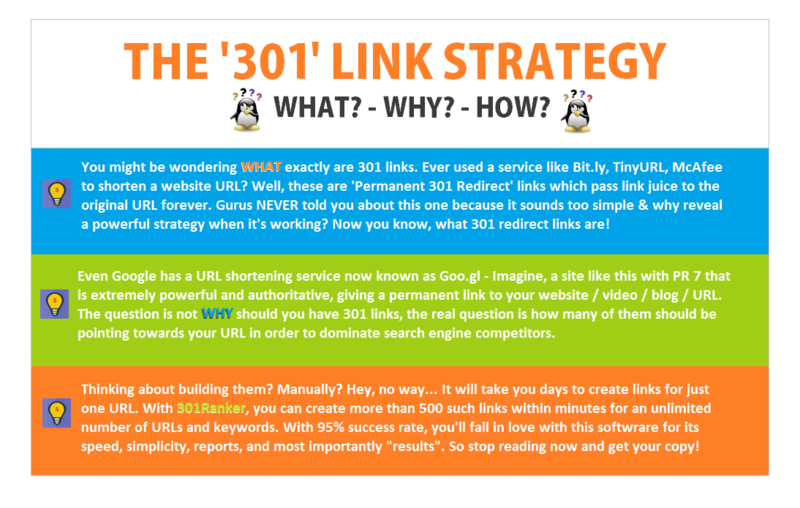 301Ranker is a 100% 'NO-SPAM' safe-to-use link building tool. You don't need to fill any kind of forms or visit websites manually. Even NO CAPTCHAS! 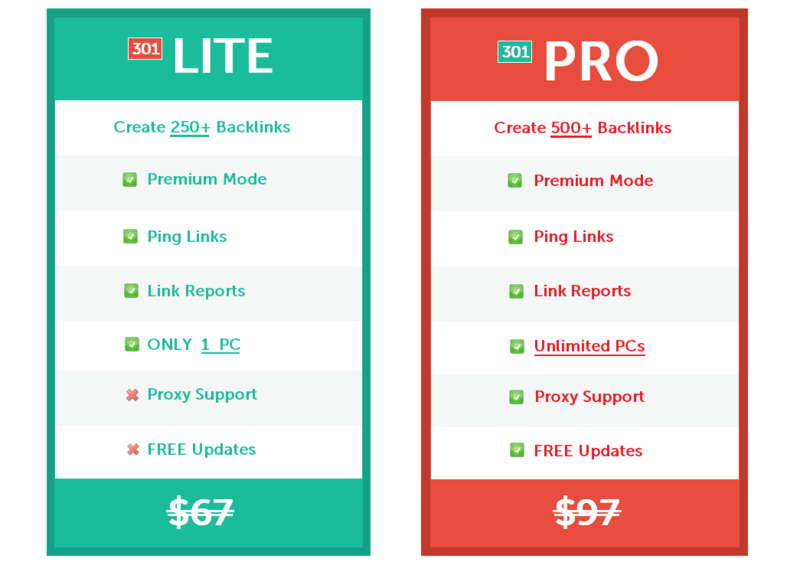 A 100% hassle-free SEO software. 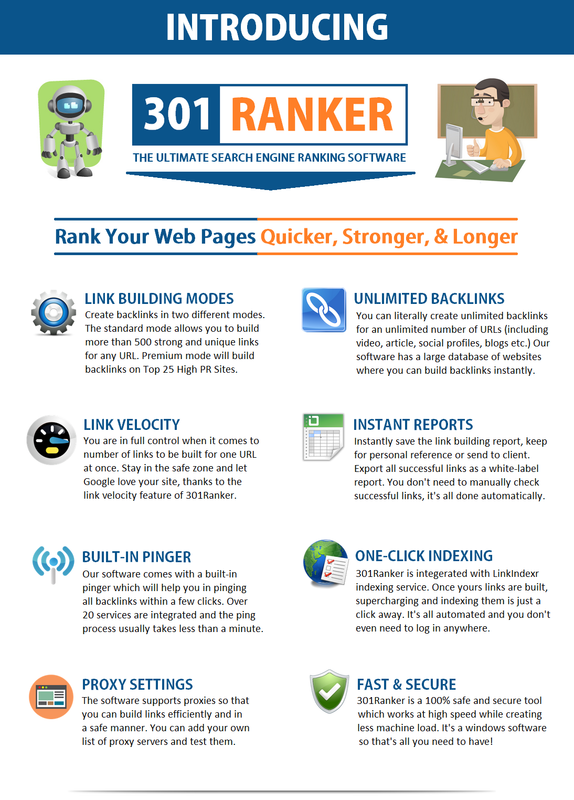 Experience the high speed link building mode of 301Ranker. Save your time & increase productivity! Forget about SEO tools that promise 'SKY' but deliver results at less than 60% success rate. We guarantee 95% SR at all times! 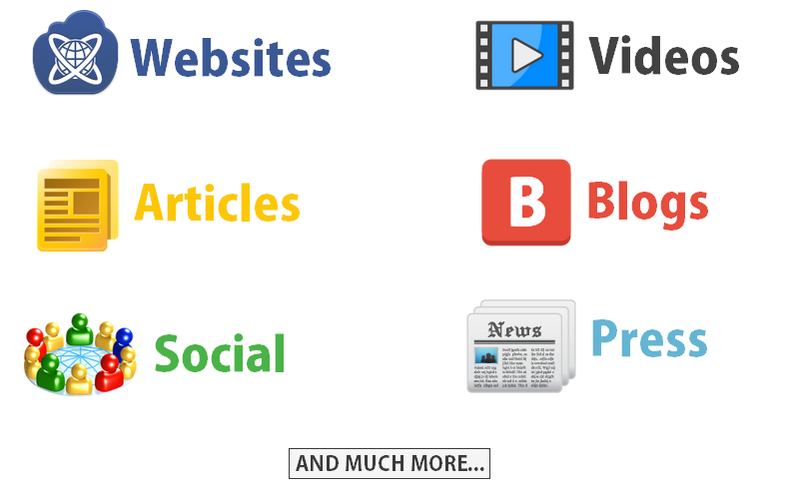 Build links for all kind of URLs with absolutely no limits! Just wanted to drop by for a quick review. Since late february, I've successfully ranked a few videos using 301 alone. 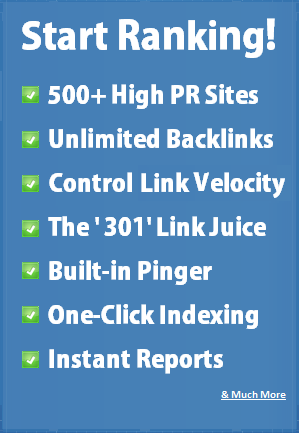 It works faster than any other link building software I've ever tried. And no captchas... seriously? Great tool! Is this software desktop or online based? This is a desktop software that will work on all Window OS versions starting from Windows 2000 to Windows 10. Not at all. You just pay once and get lifetime access to 301Ranker. We will issue refunds within 30 days of purchase for valid reasons. Our support team will do its best to resolve issues in case you experience any. Absolutely. 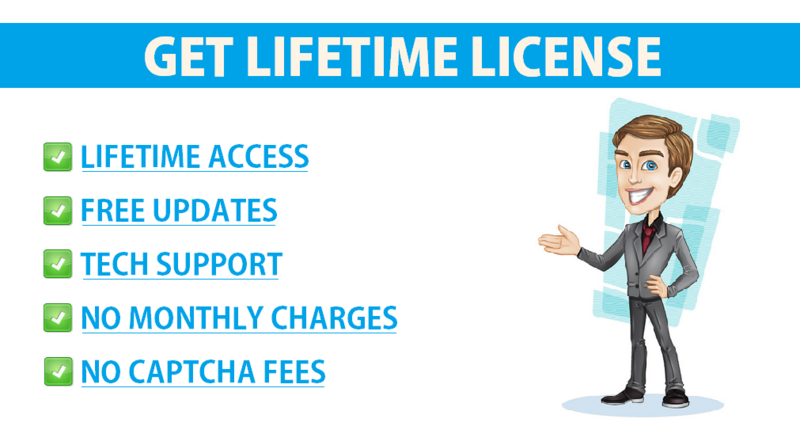 We have personally tested this software on a dozen of web pages and videos and only found awesome results. Can I build links for my client using 301Ranker? YES. 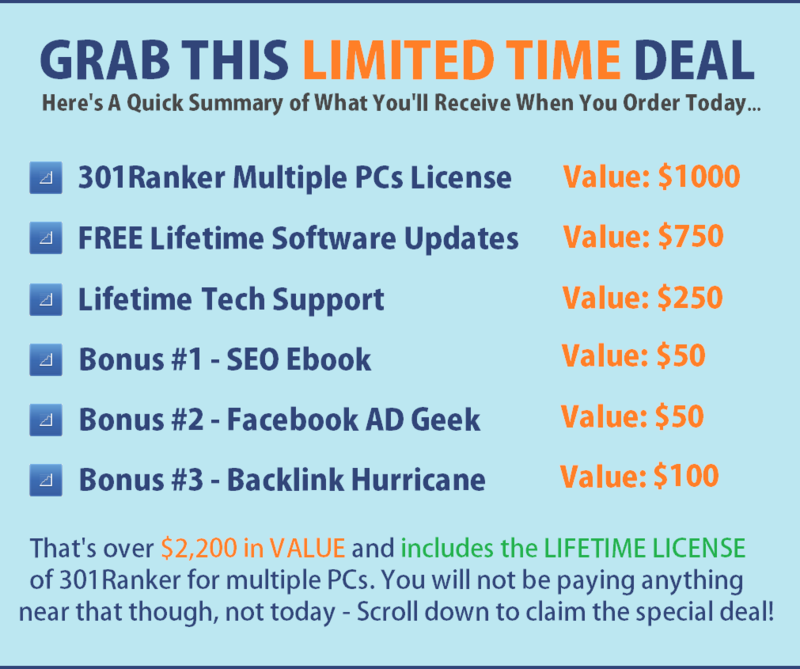 You are allowed to sell backlinks built using 301Ranker. However, the software can not be sold, resold, or given away in any form. No, 301Ranker is only built for Windows Operating System. We may launch a MAC version in future. Disclaimer: The products offered here are neither associated, affiliated or sponsored by Google, nor have they been reviewed or certified by Google.